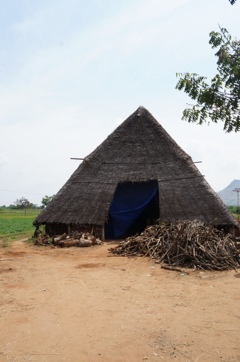 Goodbye South India, hello Delhi! 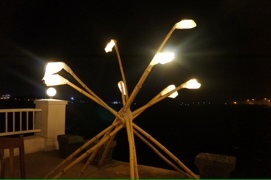 Arriving back in Fort Kochi brings the joy of the familiar – a rare event when travelling. There is one last night out with the group, at a restaurant on the very edge of the river. It’s sad to say goodbye to new friends, but four of the current crew will be joining me on the northern trip (or I will be joining them, they leave Kochi at 6am). We are a diminished group at breakfast – I’m going to miss the South Indian breakfasts! – and soon it is time to board the taxi for the hour-long journey to the airport. I’m flying via Hyderabad, though connecting passengers don’t leave the plane so I can’t tell you much about it. I was expecting delays on past experience, but the plane arrives in Delhi exactly on time, and I have already purchased a voucher from the pre-paid taxi booth by the time my pack appears on the conveyor belt. The driver is a bit bemused when I insist on holding onto the voucher – he doesn’t get paid without it, so holding it until the end of the trip is some small security that you’ll actually get to the right destination – but in these security-conscious days, there is now an inspection gate with armed security guards checking every taxi on exit, and I have to hand it over for a few minutes at least, so that we can leave the airport! 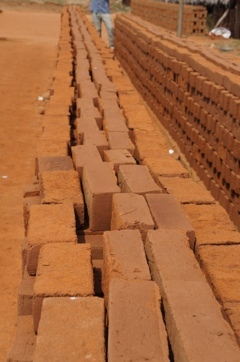 It’s a common sight in rural India, rows of bricks drying in the sun next to a basic kiln. 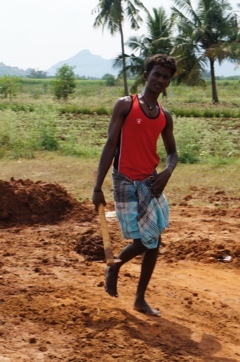 On the way to Periyar, we stopped to take a closer look, and one of the young workers gave us a quick demonstration. 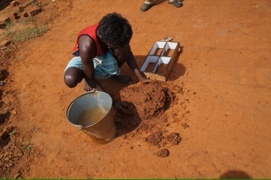 First clay is gathered, and mixed to the right consistency. 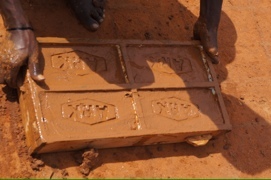 Then the clay is packed into wooden frames, four bricks to a frame. 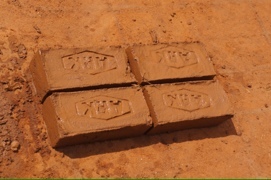 …and the bricks are left to dry. 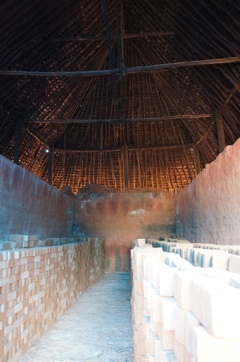 Once enough dry bricks have been prepared, the big kiln is fired up. 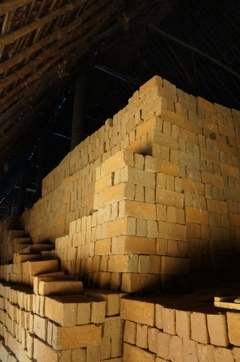 This one consists of brick walls, surrounded by a thatched roof (which doubles as a cool place to sleep in summer in between firings). 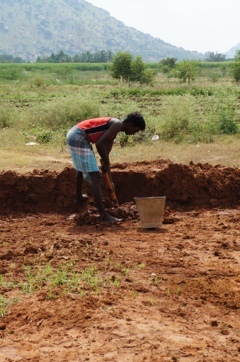 I’ve seen open firing pits too, and in some places, such as Rajasthan, they use tall conical chimneys to retain the heat. 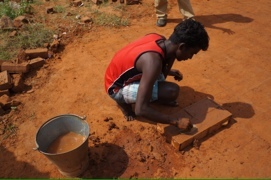 Make three hundred bricks a day, and you could earn the princely sum of 150 rupees. That’s approximately £2, or two thirds of a latte. 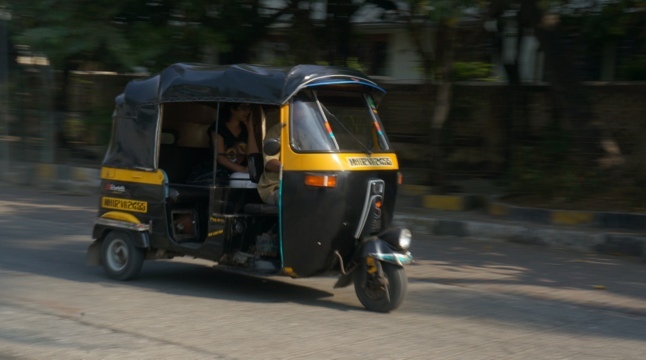 There is no shortage of tour options for day trips around Mumbai, and it’s easy enough to negotiate the city by taxi and foot. 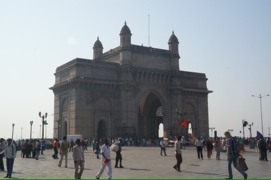 One tour with a difference is run by Mumbai Magic, which (among other tours) provides tourism training to underprivileged young people who take guests on a day trip around the city using local transport (trains, rickshaws). The concept appealed to me, but in the end I chose Urban Adventures (an offshoot of Intrepid Travel which links travellers to local guides in a growing number of cities around the world) on the basis that I would be more likely to meet other travellers. Like most Intrepid ventures, groups are limited to no more than 12 people. The price is less friendly, at about US$60, but I decided it was worth it since I have such a short time in Mumbai. 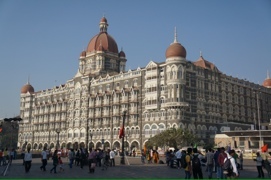 Sana, the guide, calls the hotel in the morning to confirm our meeting point: CST terminus, opposite the Times of India building. Finding the station again is easy, but where is the Times of India building? By this time running late, I stop to ask a group of policemen, who all point in exactly the opposite direction from where I thought I was headed. Thank god for google maps (and the local sim card) – two minutes later I am racing back past the policemen, keeping an eye out for Sana in her red jacket, and for the rest of the tour group. Surprise number two: once again I have the exclusive services of my guide, as the sole guest on the tour. 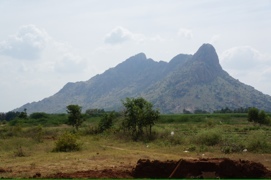 This turns out to be ideal, particularly as the tour uses local transport (taxis, train, rickshaws and a reasonable amount of walking) – much easier for the two of us to negotiate crowds. Sana greets me with a cheerful “Happy Makar Sankranti!”, and explains the origins of the festival (it marks the transition of the sun into Capricorn, the turning point of winter, a day to honour Saraswati the goddess of knowledge, and any number of regional variations). We wander through Fort and into Colaba, past mouldering Victorian buildings (the shaded verandahs of which shelter all kinds of market stalls – given India’s prudish reputation I’m amused to see an array of vibrators on one stall!). Near the Flora Fountain we pass the Rajabai clocktower, built by a Parsi gentleman for his blind mother. A tenet of Parsi belief is that food may not be eaten after sunset, so the clocktower was an extravagant way to ensure that she knew when it was time for tea. Sana points out a particularly dilapidated old building. 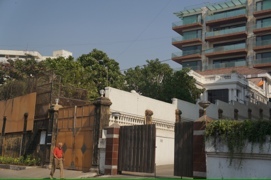 In British colonial times, this was Watson’s hotel, a glamorous 5 star hotel for Europeans only. 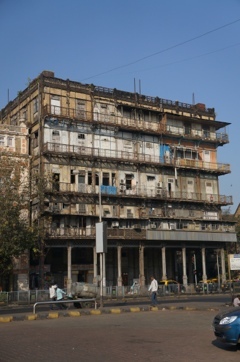 Another wealthy Parsi gentleman by the name of Tata, incensed at being refused entry, had his revenge by building his own hotel, superior in every way to Watson’s – not least, these days, in that it remains the best hotel in Mumbai, while Watson’s is a barely-recognisable wreck. 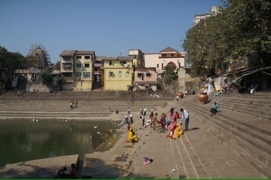 Leaping into a taxi, we head for Babulnath Mandir, a temple dedicated to Shiva, where we take a lift to the top (! ), abandon our shoes, and wander inside. A vat of milk (for purity) is dripping steadily onto a Shiva lingam (basically a stone phallus) next to a statue of a cow with unnaturally shiny horns. As I watch, a succession of worshippers touch the horns with forefinger and little finger, and lean forward to kiss the statue. 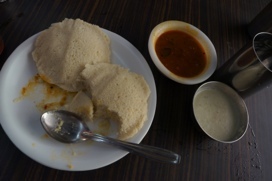 Outside, we dodge the vendors selling garlands of marigolds, and stop into a tiny tea shop where I am introduced to idli, a South Indian breakfast snack that looks like a steamed cake of couscous, served with spicy sambhar and a coconut and yogurt dip. 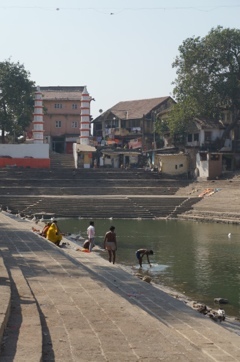 We return to Banganga, which by day looks entirely different – women are setting out freshly-washed saris to dry in the sun, and there are young men swimming in the reservoir while ducks float along the edges (ash with a touch of giardia, anyone?). Kites are for sale at the stalls lining the entrance. 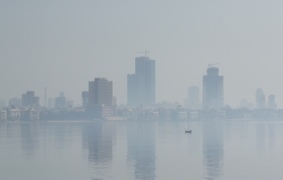 Our next stop is the waterfront, for a glimpse of Haji Ali, a mosque that seems to floating the harbour at the end of its long causeway, then across the subway and into another cab, past the racecourse (where a helicopter is landing), to Dhobi ghat – the biggest laundry in Mumbai. It’s an incredible sight – rows of concrete vats, industrial machines, and colour coded washing. Everything has a section and (like the city’s famous tiffin-wallahs) nothing is misplaced. 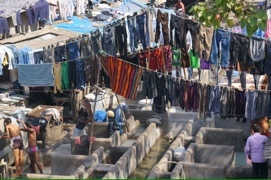 Men push heavy carts loaded with sacks of dirty washing to the ghat, and return at the end of the day with the same sacks full of freshly laundered clothes. By now it is nearly lunch time. 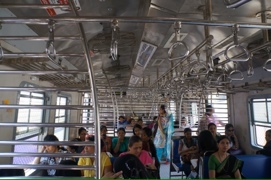 We take a ladies-only carriage on the local train to Matunga Road – my neighbour on the train informs me that these carriages become unisex after 10pm, another reason why less women travel at night. The doors to each carriage stay open except during the monsoon, and when it’s busy it’s best to position yourself nearby, as the train stops for only a few minutes at each platform where more passengers are waiting to force their way inside. Today, the second Saturday of the month, many offices have a day off, and we’re travelling off peak, so the carriage is nearly empty. At Matunga we find our way to Ram Ashraya, which Sana describes as the best South Indian restaurant in an area heavily populated by Sth Indian migrants. There is quite a queue, but Sana is a regular visitor and when he sees her the manager waives us straight in – “she is a guest, you cannot be waiting”. I am the only non-local in the place, and there is no menu – everyone knows what is on offer. Sana orders for me, a divine Mysore masala dosa (crispy rice pancake lined with spicy sauce and a potato mash) and to follow some dahiwada, delicious sweet dumplings in fresh yogurt. I have fun trying to eat the dosa with my right hand (eating with your left hand is horribly offensive apparently, that hand being reserved for matters toilet. So basically I am doomed to mortally offend the locals sooner or later. Oh well…). 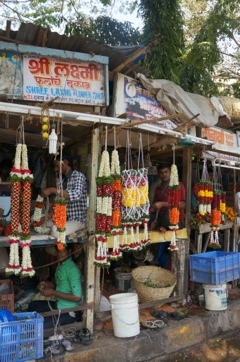 After lunch we wander along the flower market, where double-decker huts serve as shops, and men crouch inside stringing together wreaths of blossom, each colour and flower for its own particular occasion. The last area we visit, by autorickshaw this time, is the trendy Bandra district. We pause at Mount Mary, where you can buy a candle in any shape you like (no, I didn’t test them on that) to light inside the large Catholic church perched on the top of the hill. Inside it is cool and peaceful, the walls lined with paintings of bible stories depicting the Virgin Mary, who looks distinctly Indian. And here’s what all the fuss is about, “King Khan” – no, I don’t get it either. By the time we take one last taxi over the Bandra Worli Sealink bridge and back to the hotel, I am exhausted. A quiet night in has never looked so good. I bid farewell to Sana and retreat to my room, room service (navratan korma, not quite the way it looked on Wikipedia, with a lot of cream and paneer) and the unique delights of Indian TV. 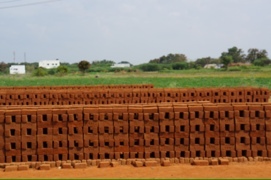 Things are heating up in the local elections, with the leader of the Dalit (untouchable) party crying foul over an official decision to cover the statues she has erected of herself, as well as any statues of elephants (the party symbol) until after the election. In a country where a large proportion of the electorate is illiterate, a party’s symbol becomes all-important but, given the ubiquity of Ganesha statues, it would be a miracle if they manage to cover them all. I give up on the news and settle for a cheesy Tom Cruise movie which I’m guessing went straight to DVD. The English subtitles throughout provide unintentional amusement – not so much as the hint of a swear word, even “kiss my arse” becomes “kiss my behind”, and other four letter words have been deleted altogether. My favourite advert is for a new Nestlé product, aimed at converting a nation of chai-drinkers with the assistance of the gorgeous Aishwarya Rai (actress and former Miss India). It’s called “My First Cup”, and the tag line reads, “isn’t it time you started?”. Well, quite. It’s a long way to Goa, it’s a long way to go…. So. 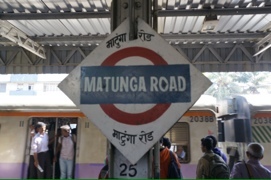 Just arrived back in Mumbai on an all-night train from Aurangabad. I shared a sleeper compartment with 5 middle aged Indian males, which basically means a lot of burping, hoicking and farting, several rounds of the “where are you from” game, and not a hell of a lot of sleep. It was pitch black when I arrived in Mumbai, so I took a taxi straight to the airport. Armed with my newfound knowledge that the going rate for a prepay taxi, no aircon, is 450 rupees, I managed to find an aircon minivan for 500 INR – things are looking up! Left Aurangabad at 10pm last night, and now have mere 5 hours to wait til my flight to Goa. Then another hour in the car to Palolem. But THEN I will have 5 days lying on the beach doing nothing, so it’s swings and roundabouts, I’m sure you’ll agree. The wifi in Aurangabad was non-existent but I have high hopes for Goa – stay tuned for a proper post on everything I’ve been up to for the last few days! In the mean time, here is a teaser…..
Tigers are Very Cool Indeed. 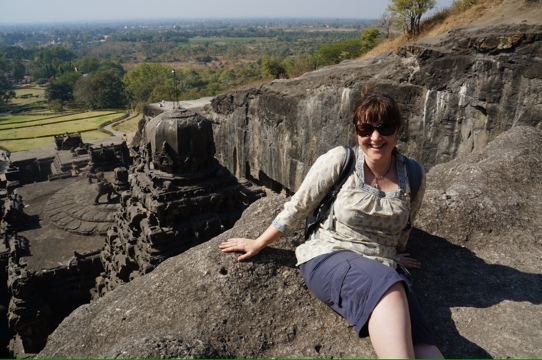 I’m a thirty-something kiwi, recovering corporate lawyer, foodie, coffee-fiend, voracious reader and theatre-lover, with a bad case of the travelling bug. My first big trip abroad was a year studying at an all-girls high school in Utsunomiya, Japan. After doing time as a book-buyer for a chain bookshop in Auckland, New Zealand, I finally got around to finishing a degree, and then another one, and somehow found myself working as a commercial solicitor at a large New Zealand law firm. The itchy feet persisted so, after a six-week test-run travelling solo around Europe, I took the plunge and moved to London (with just about everyone I knew from law school, as it turned out). For the last 4 years I’ve been working as a corporate lawyer in the City, mainly to fund my travel habit, and squeezing in trips to Morocco, Egypt, Spain, France, Germany, Austria, Italy, Slovenia, Croatia, Bosnia, the Czech Republic, Hungary, Wales, Scotland and – last, but certainly not least – Ireland (in search of my past and an cúpla focal).